Johnny & Lucy - 9 weeks! naughty girl, this is her new thing. She is growing up so fast, she has already doubled in size from six to nine weeks! Our family is in love with her even Johnny! They can play for hours and we can watch them the whole time. Sad I know! This past Saturday was my Grandpa's 80th birthday party! I was a bad Granddaughter and didn't bring my camera. When you do it for a living you sometimes just don't feel like taking photos! Plus you can either document the moment or enjoy the moment. We had lot's of family in town that I have not seen for a long time so I chose to enjoy the moment. A couple people were taking photos so I didn't feel so bad. 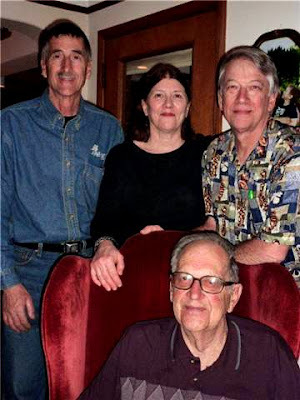 This is the only photo I have got my hands on so far.....It is a beautiful photo of my Grandpa and three of his five children! I just had to post some pictures of Jen and her new puppy that she got to meet yesterday! She is only four weeks but will be able to take her home in early April. So cute and can't wait to meet her! You will have to come over so she can play with lucy and johnny! Tomorrow is a very special day for my friend Nan. Your family will be in my heart and prayers! 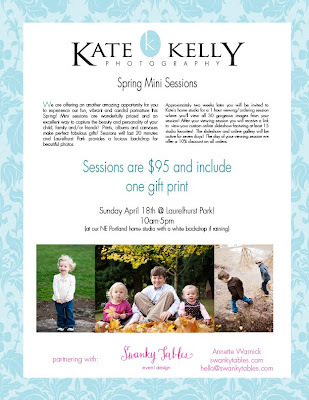 Kate Kelly Photography presents our Spring Mini Sessions! Sunday, April 18th from 10am - 5 pm @ Laurelhurst Park. 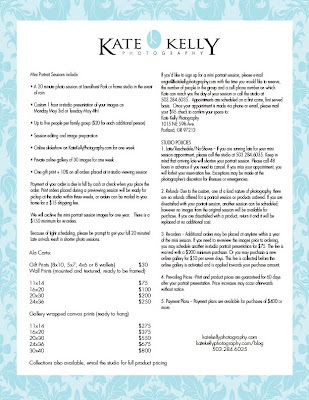 Please email me at angie@katekellyphotography.com to sign up or if you have any additional questions.